Hello. I hope your weekend is going well. I am so excited that I don't have to go to work tomorrow! I cannot believe that my 12 Days of Christmas series is about done either. I have a super easy idea to share with you. So here's what a I did: I cut the "Peace" out of white glitter paper (I wanted to use the silver that I have, but that wasn't happening. Note to self: NEVER buy self-adhesive glitter paper. Nothing cuts it!). I used a die from The Stamp Doctor. Then I created the bow by following a great how to video on You Tube and attached it to the ornament with a glue dot. I then added the ribbon for the hanger part and viola! 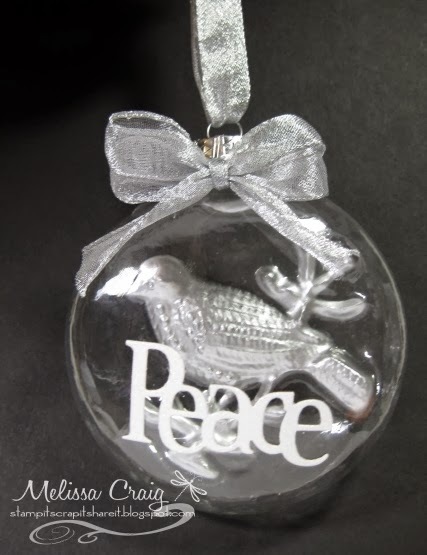 An inexpensive ornament that's a little festive.